Lignocellulosic waste such as sawdust or straw can be used to produce biofuel – but only if the long cellulose and xylan chains can be successfully broken down into smaller sugar molecules. To do this, fungi are used which, by means of a specific chemical signal, can be made to produce the necessary enzymes. Because this procedure is, however, very expensive, Vienna University of Technology has been investigating the molecular switch that regulates enzyme production in the fungus. As a result, it is now possible to manufacture genetically modified fungi that produce the necessary enzymes fully independently, thus making biofuel production significantly cheaper. Biofuel can be obtained quite easily from starchy plants – but this places fuel production in competition with food production. Manufacturing biofuel from lignocellulose is therefore a preferable option. “Lignocellulose from wood waste or straw is the world’s most common renewable raw material but, due to its complex structure, it is significantly more difficult to exploit than starch” explains Prof. Robert Mach from the Institute of Chemical Engineering at Vienna University of Technology. Biofuel manufacturing uses the Trichoderma fungus, which produces enzymes that are capable of breaking down the cellulose and xylan chains into sugar molecules. The fungus does not, however, always produce these enzymes; production must be stimulated using what is known as an ‘inductor’ (disaccharide sophorose). Sophorose as a pure substance currently has a market value of around EUR 2500 per gram – by way of comparison, one gram of gold costs around EUR 40. “The high costs of the chemical inductor are a decisive price driver in biofuel manufacturing”, says Robert Mach. Many different strains of fungus have been analysed at Vienna University of Technology, with varying productivity. “In one of the strains, a random mutation occurred, which stopped the chemical switch in the fungus from functioning”, reports Robert Mach. 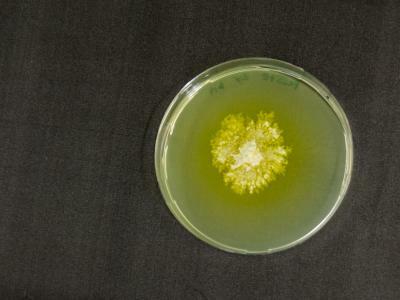 Even without an inductor, this mutated fungus always produces the desired enzymes and, unlike other strains of fungus, does not stop doing so once a high glucose concentration has been reached. “In these fungi, the molecular switch is always set to enzyme production”, says Christian Derntl, lead author of the recent publication ‘Biotechnology for Biofuels‘. Through genetic analysis, it has been possible to identify which gene is required for this behaviour and which protein the gene mutation affects. As a result, it has been possible to induce the same mutation in a targeted fashion in other strains of fungus. “We have understood the mechanism of this molecular switch and, consequently, many wonderful possibilities are opening up for us”, says project group leader Astrid Mach-Aigner. Other genetic changes are now being tested in a targeted manner, which may even result in further possibilities for improvement, leading to even more productive fungi. This would make the production of fuel from lignocellulose more economically attractive. Next articleLightest exoplanet imaged so far?